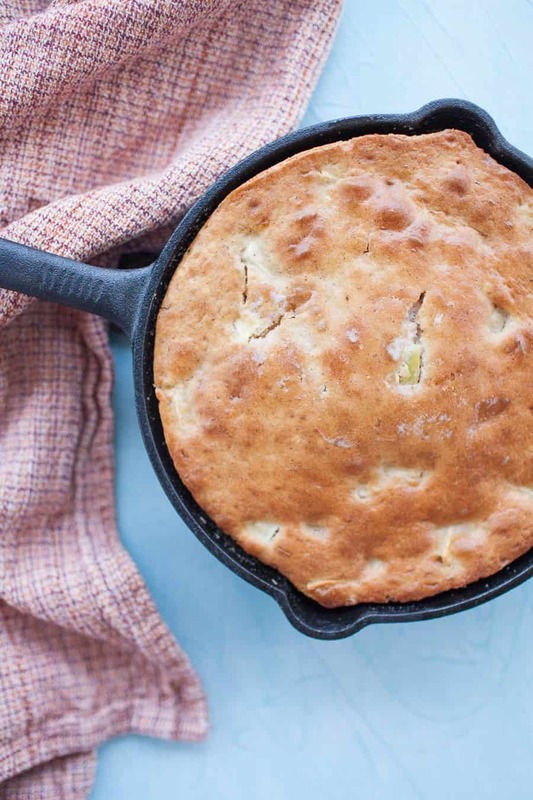 Cast Iron Apple Spice Skillet Cake is the perfect fall dessert! It’s quick and easy to make, needing only five ingredients, including a box of cake mix. This cake is baked in a cast iron skillet for an extra rustic touch and fun way to serve your dessert. A few years ago, my mom threw me a fall themed baby shower. At the party, we served a lot of fall favorites including one of the easiest recipes ever for apple spice cupcakes. It was a recipe we came up with on a whim and we were lucky it worked! As this fall season rolled around, I could wait to try to make a new version of this cake. I discovered the fun in making cast iron skillet cakes when I made this pineapple upside down skillet cake a few summers ago. Baking cakes in cast iron skillets is such a fun and rustic way to not only bake cakes but also to serve them. 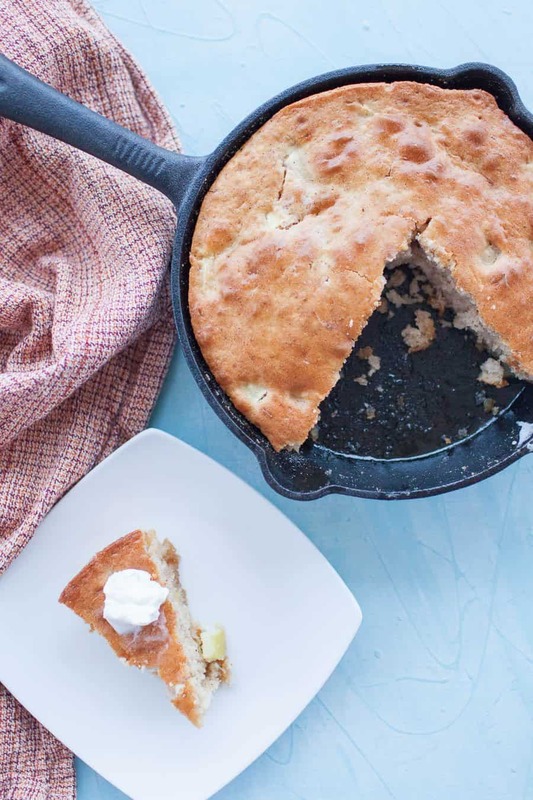 This cast iron apple spice skillet cake was a natural choice for a quick after dinner dessert. It’s also super easy to make and share when having friends over or even for a party. Presenting a cake in a skillet will take people by surprise and make for a fun conversation topic for a while. What I love most about this cake actually isn’t how it looks or even how it tastes. It’s how simple it is. Simple as in FIVE ingredients. Yep. You read that right. See, the beauty of this recipe is that it uses a cake mix for the base of the apple spice cake. I’m all about homemade desserts from scratch but in a pinch this recipe is ideal for a quick and easy dessert. How do you make a cake in a cast iron skillet? You make a cake in a cast iron just like a regular cake! Mix up cake mix according to instructions, pour into pan and bake at 350° for 25 minutes or until cake is golden brown. How do you clean a cast iron skillet? What does it mean to season a cast iron skillet? Seasoning a cast iron skillet just means to prepare it for cooking. Why do you need to season a cast iron skillet? The surface of a cast iron is rough, which would make it hard to cook foods on. So by preparing it for cooking, we are adding oil to the pan and essentially trapping the oil on top of the bumpy surface. This allows food to cook without sticking or getting trapped in the rough surface of the skillet. How do you season a cast iron skillet? Start by pouring 1/2 cup of salt into the pan and use a paper towel to rub the salt all over the pan. This will remove dust and impurities from the pan and get it primed for seasoning. Then rinse the pan off in the sink and dry it off with a towel or by putting it on the stove over low heat. Pour vegetable oil into the pan and use a paper towel to cover the surface completely. Place in oven at 450° for 30 minutes. Then allow to cool. If you’ve never seasoned your cast iron skillet, you should start there. Follow the steps to remove clean the pan first, then season with oil. Cleaning the pan with soap is okay, once you’ve seasoned the pan. This is because seasoning the pan adds a thin layer of polymerized oil which won’t be broken down by soap. What tools do I need to make a Cast Iron Apple Spice Skillet Cake? Looking for more apple recipes? 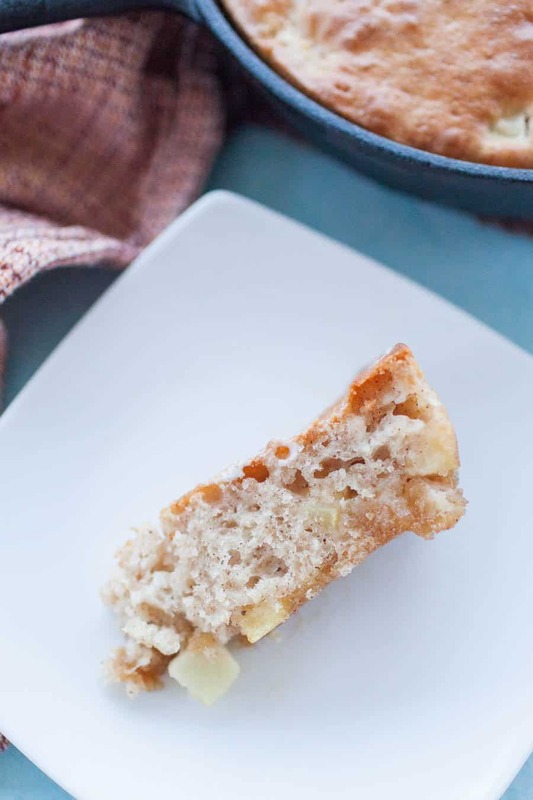 Check out this Apple Olive Oil Cake or Spiced Apple Dutch Baby Pancakes. For dinner, try this pan seared apple pork tenderloin. 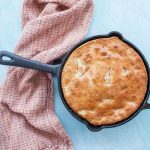 Cast Iron Apple Skillet Cake is the perfect fall dessert! It’s quick and easy to make, needing only five ingredients, including a box of cake mix. This cake is baked in a cast iron skillet for an extra rustic touch and fun way to serve your dessert. Preheat oven to 350 (or temperature on the cake mix package). Add in diced apples and cinnamon. Brush melted butter onto large cast iron skillet (7 inches) or two small cast iron skillets. Add brown sugar and spread evenly along bottom of pan. Bake for 25 minutes or the time listed on cake box. You can also skip the butter and brown sugar lining and make these into cupcakes instead. Cooking time may vary.